With handcrafted details and a world-class design, this beautiful wheelbarrow is the perfect home for flowers, herbs, and vines of all shapes and sizes! 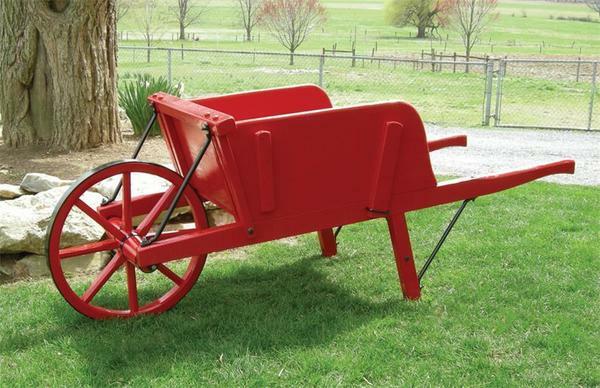 Built by expert Amish craftsmen right here in the USA, every piece of these long-lasting wheelbarrows is built with rustic longevity in mind. If you choose to use the wheelbarrow as a full-time planter, add the optional galvanized liner to ensure that the wheelbarrow stays beautiful and strong. Add a hand-paint murals to your order to personalize the wheelbarrow. This is a great idea for anniversary gifts, wedding gifts or memorials for lost loved ones. Scripture quotes are also a popular idea for the wheelbarrow sides. The wheelbarrow is ships disassembled and carefully packed in a small box to save on shipping costs and storage space. The box is very compact, and the wheelbarrow is wrapped and shrink-wrapped to protect it during the shipping process. It is simple to assemble, and comes with an instruction sheet to walk you through the steps. If you happen to be in the Sarasota, Florida area please stop by our Amish furniture store near the Pinecraft Amish area of town. We would love to meet you and show you around our beautiful store.